Did the Battle of Brunanburh in AD 937 take place on Dibbinsdale’s doorstep? This was a very important turning point in history of the English. Over 100,000 soldiers took part in what was said to be a very bloody battle with great loss of life. The was recorded in the Anglo-Saxon Chronicle of the time. The exact whereabouts of the battle is lost in time. No one knows for certain. There are no proper remaining records. It is known that it was fought by Athelstan, King of the Mercians andWest Saxons, against a combined army of Viking kings and chiefs. The battle that was won by the Saxon king, Athelstan. 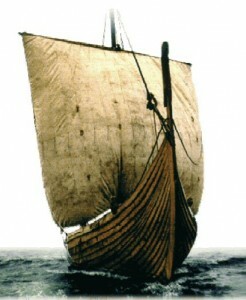 It meant that the threat of Viking control of the mainland of Britain was ended. After Athelstan, the Saxon kings united the land under the one king of all of England. The armies of the Vikings came to England from Ireland, Scotland, Wales and Europe by sea. It is most likely that the invaders landed somewhere in the North West of England – the nearest place for them all to meet. Some think that this Viking army would have congregated together somewhere they had welcoming friends. 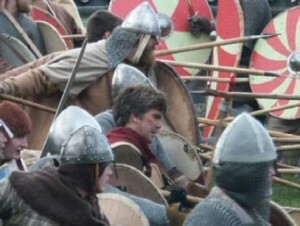 There were already Viking settlers on Wirral. The place names of Wirral ending in “by”, like Irby and Frankby are evidence of this. Bromborough was once known as Brunburg, a very similar name to Brunanburh. 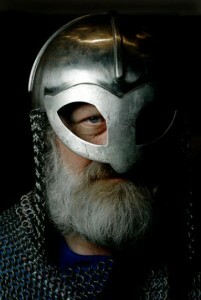 It is also close to a possible landing place for a Viking army – Bromborough Pool. This estuary led out via the River Mersey to theIrish Sea. The Dibbin Valley acted as a boundary between Saxon and Viking settlers on the Wirral. Eastham and Bromborough are Saxon names whilst Raby, which is close by, is a Viking one. There are other names that are of interest in the area. The large sandstone cliffs in the river valley are called the ‘clints’- this is a Viking word meaning a lookout place. On Storeton Hill there is a road now called ‘Redhill’, and a field name near Bromborough Pool called ‘wargraves’. Was this where a battle was fought ? Some think it was on a heathland near Brakenwood golf course. As yet there is no hard evidence of the battle. However, Wirral did become a Saxon land. There are still descendants of Vikings settlers here on Wirral. The mystery of the Battle of Brunanburh continues.